I made a simple newbie mistake a while ago. It's one that frustrates me because it's very easy to do and looking around the web it seems to be common, but the RV manufacturers don't seem to have a good solution. I'm hoping that with this post I can educate others to avoid the mistake, or to recover if necessary. 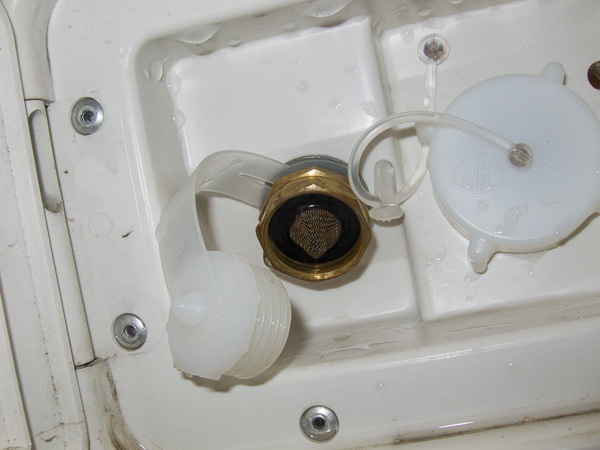 The mistake in question: the city water hookup has a little check valve. If you press in the valve while there is pressure in the system, you can damage the valve. As part of winterizing, if you're not using compressed air, you should (after you drain the rest of the system) press the check valve in. Otherwise surface tension can hold a bit of water in your city water line. But don't do it when the system is pressurized! Specifically, there is a little rubber O-ring on the check valve. 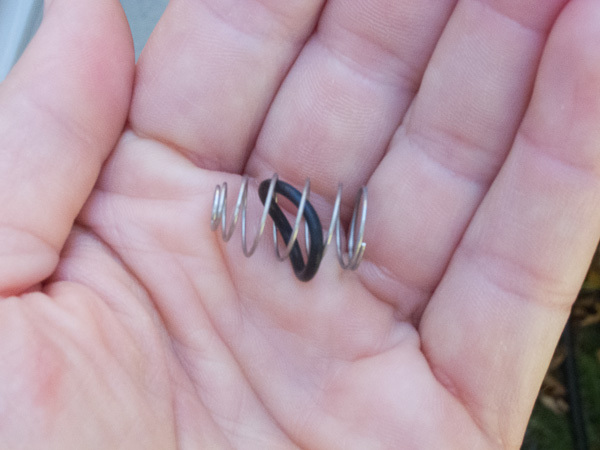 If you press the valve in while there is pressure in the system, this O-ring can become unseated and won't seal properly. 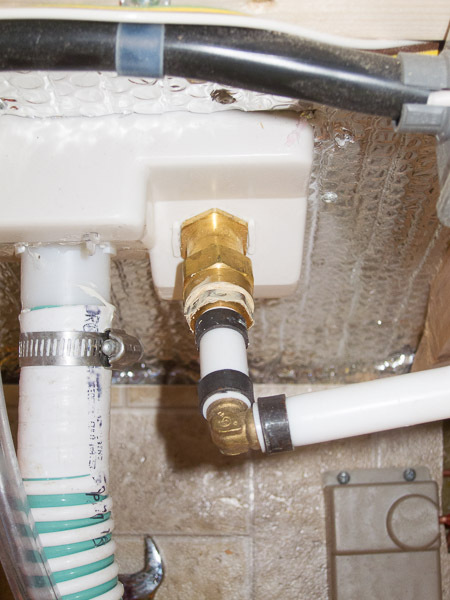 From that point, when your system is pressurized, the city water hookup will leak. I asked Reace about repairing this, and his response was that these are sealed units and aren't repairable. I wasn't happy about that answer, but it freed me up to experiment. It seems at this point that I did successfully repair the problem. 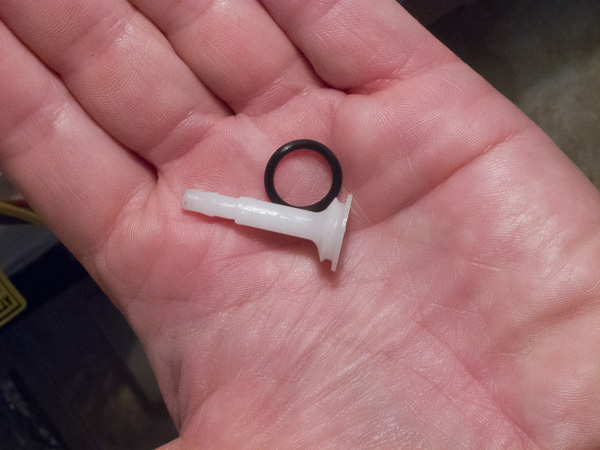 That white plastic thing inside is the check valve. 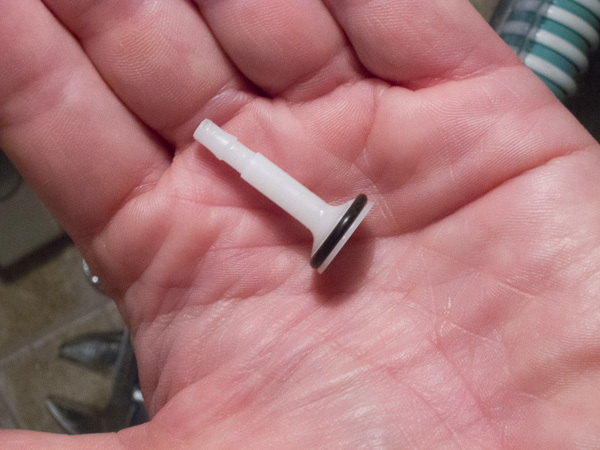 There's a white plastic valve stem, with an O-ring held against the inside of the valve by the spring you can sort-of see in that photo. 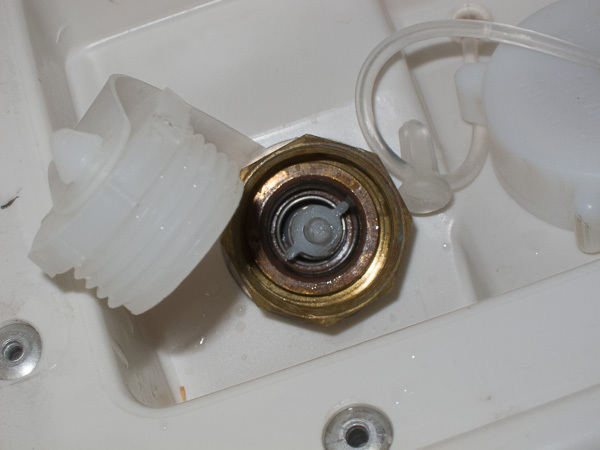 The spring is held on with the white plastic cap press-fitted onto the valve stem. My mistake was to press in the valve stem while the system was pressurized. Don't do that. That's the first thing you should take from this post. Completely drain your system before you touch that valve stem. But if you do, you may find afterwards that your city water hook leaks when you have your pump turned on and your system pressurized. 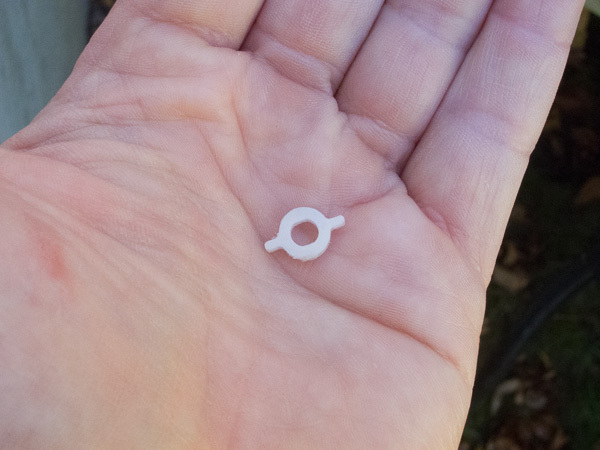 The problem is that the O-ring I talked about has become unseated. OK, so what next? I tried re-inserting the O-ring at this point, but had no luck. I managed to get it pushed back into the valve, but it wasn't seated properly and the best I could manage was a slow leak. To effect a true repair, I needed to take the valve apart. The forum limits me to 8 pictures in a post, so the repair follows in the next post. That's a 1" on the fitting, and a 7/8" on the compression nut. (The 7/8" was a little loose, so I'm wondering if it was actually 21mm, but I didn't have a 21mm wrench so can't be sure.) 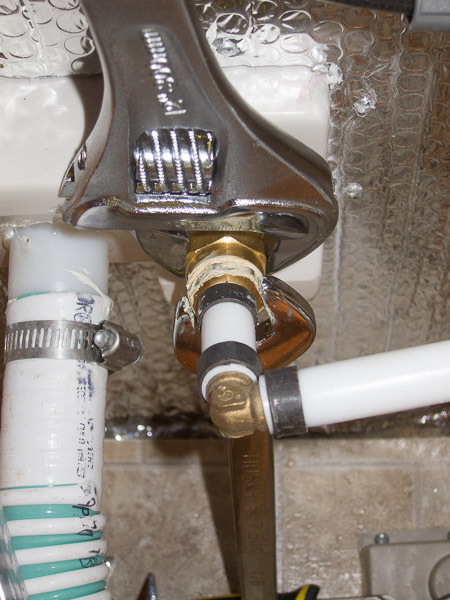 I think the reason so much force was required is because the compression nut doesn't have a swivle at the pipe end -- by turning that nut, you also have to turn the compression fitting inside the pipe. Is that wise? I don't know, but it seems to have worked. I will keep an eye on things to make sure it doesn't leak, but it is in an awkward spot to check once the bed platform is reinstalled. Putting the valve stem back in was a challenge. 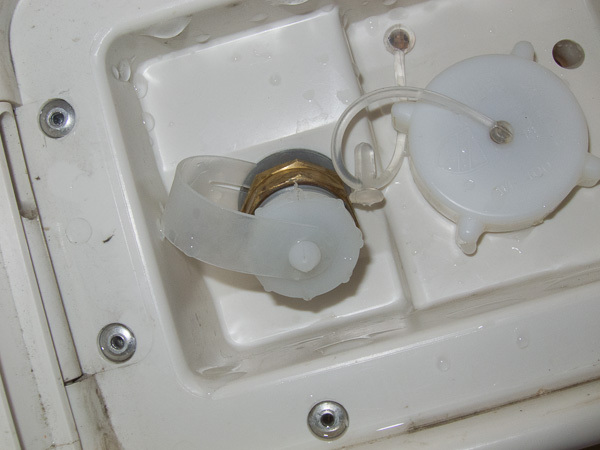 It would have been easier with a second set of hands: somebody inside the trailer to hold the stem in place while the spring and plastic cap were reset. 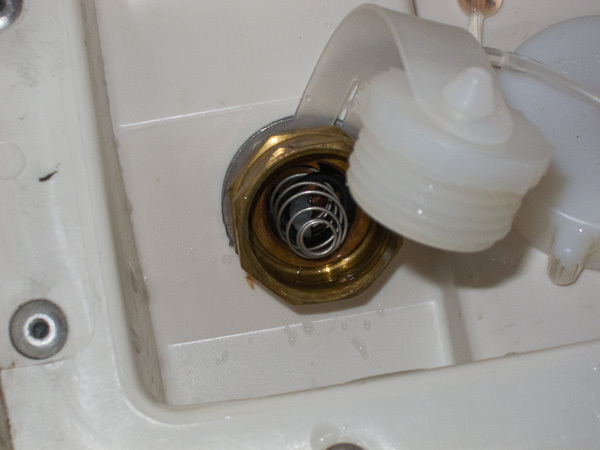 But I managed by myself by wedging a rag in the fitting to hold the stem in place while I inserted the spring, put the white plastic cap back on the valve stem loosely, managed to grab the tip of the valve stem with pliers and pushed the cap back on tight with a punch. Hope that helps, and feel free to correct me if you see something I did wrong or poorly. WOW!! Thanks for taking the time and photos necessary to post this information. Good to know when I manage to mess the value up it can be repaired. One of the best tutorials I've ever seen. Nice job! Doug - I think you should put this into a file for the "Files" section. There's a section there for info like this. That way it won't get buried as time and topics go by. Great job! Excellent photos and excellent information -- thanks very much! I stickied the thread to keep it at the top...nice work Doug. A picture is still worth a thousand words. That's a 1" on the fitting, and a 7/8" on the compression nut. (The 7/8" was a little loose, so I'm wondering if it was actually 21mm, but I didn't have a 21mm wrench so can't be sure.) 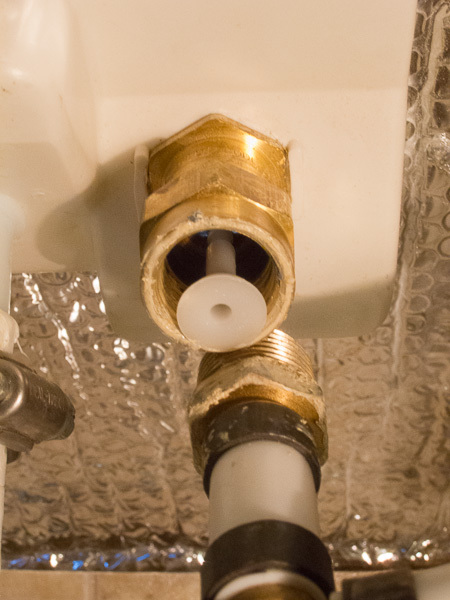 I think the reason so much force was required is because the compression nut doesn't have a swivle at the pipe end -- by turning that nut, you also have to turn the compression fitting inside the pipe. You refer to a "compression fitting" and "compression nut", but the body of the inlet fitting (which contains the check valve) appears to be a common tapered pipe thread joint (likely 1/2" NPT size); the body has a female pipe thread, and the fitting on the piping is a male pipe thread to barb adapter which is necessary to attach the tubing and to retain the check valve parts in the inlet assembly body. The PEX tubing is attached to a barb on the adapter by a crimped ring; this isn't called a compression fitting. 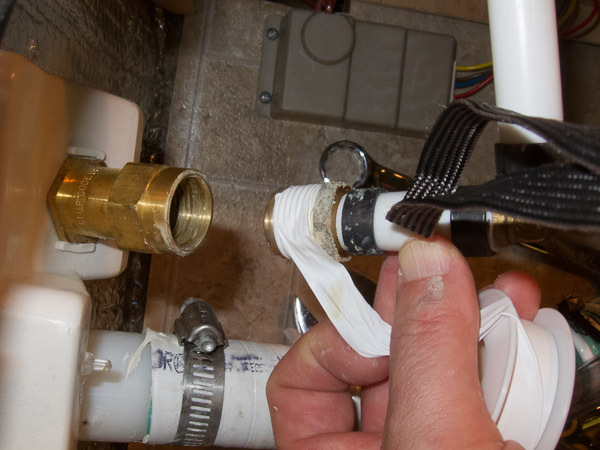 The original brown stuff and your white PTFE plumber's tape are sealants, which are needed for pipe threads like this and are not used in compression fittings. The barbed connection doesn't use a sealant, and also doesn't include a nut. No, there's no swivel: it's annoying, but normally the pipe thread would be assembled then the PEX tubing would be crimped onto the barb - it's one of those build-only things that's hard to repair. If you cut the PEX tubing to allow the pipe thread to turn, then you have to re-make the next crimped joint down the line, and there's just no good place to do that. If you turn the pipe threaded adapter without the tubing turning (which I believe is what Doug did), it certainly would be hard to turn... those crimped connections of tubing to fitting barbs are not supposed to have the barb turned inside the tubing after being crimped together. An alternative would be to cut off the PEX tubing as close as possible to the adapter fitting, easily unscrew that fitting, and put it back together with another adapter of the same kind (which means you need a crimping tool) or a kind which attaches to the PEX by different method; a direct replacement not needing crimping would (for instance) be a SharkBite 1/2" MNPT connector, but there are other choices such as NPT to compression adapters. You could even eliminate the elbow which is the next part down the line by using an elbow NPT to SharkBite connector, connecting straight to the piece of tubing which runs out of the photos to the right. There might be varying opinions on the reliability of O-ring sealed connections such as the SharkBites; a more traditional and very secure alternative is a real compression fitting - I assume those are available sized suitably for PEX tubing, which is what I assume is in the Escape. I also had a similar problem with my city water connection. Mine came apart for some unknown reason preventing the water supply from entering. I too was told it was un-repairable but managed to get it to stay together using super glue to keep the spring retainer in place. The only other option seems to be to purchase and install a complete new water connection box.